Is ‘Reverse Innovation’ Really Innovation? 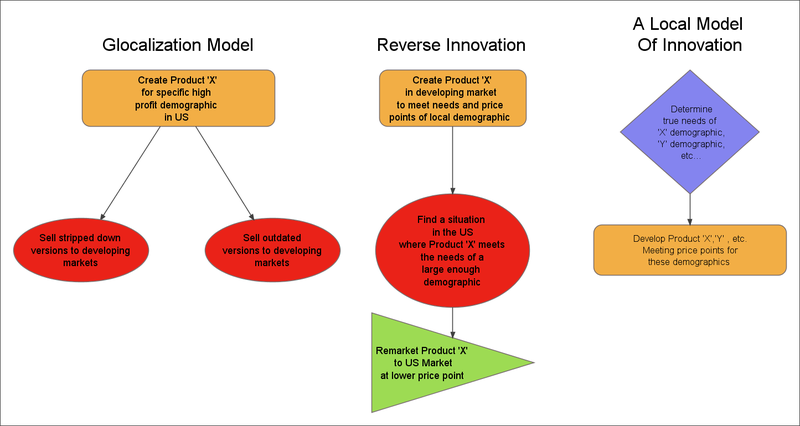 In a nutshell, Reverse Innovation is a process by which Product ‘X’ gets developed in and for places like China or India. It meets very specific needs at a lower price. However, after launch there is a realization in the U.S. that Product ‘X’ meets needs for a sizable demographic within the U.S., at the lower price. In a strange twist, a company creates products that compete against its own products. Instead of expensive, feature rich products being developed in the U.S. and then being modified for sales overseas, products get developed overseas and come back to the U.S. at a lower price point. That said, is reverse innovation truly innovation? Ultimately innovation, which involves bringing good designs to market at acceptable price points, comes from knowing the customer. This should be done on a local level, and that part of reverse innovation is on the mark. However, it shouldn’t take someone creating a device in a different country to open one’s eyes to a market for that same product in the U.S.. I don’t think there are very many people that enjoy presentations, at least typical presentations. You know what I mean. The ones where you walk into the conference room and see a stacked printout of what your senses are about to experience for the next 4 hours. Then there are the times when someone tells you about a great Slideshare presentation and you click on the link and see that it’s 83 slides long. The first thing that goes through my mind is, “Who were the poor people who had to sit through this?” Then with all the strength I have I hit the arrow key to advance from slide #1 and begin the march through PowerPoint oblivion. Don’t get me wrong, I’m sure there are amazing presenters that could make an 83 slide presentation interesting and engaging for two hours. I just haven’t come across any. Thankfully, there is a better way. Twenty Images x 20 Seconds Each = Six Minutes and Forty Seconds. The presenter has to distill her message down and the listeners are not forced to have to find valuable information buried in hours of presentations. By keeping presentations short and sweet, you can have multiple presentations, and most of all, you can have more time for discussion – which hopefully is why you’re in on the presentation in the first place. In the end, that’s okay because each presentation is less of an exercise in endurance and more a work of art. So give Pecha-Kucha a try. I think you’ll find yourself sold on the concept. If you’d like to see it in action, check on line to see if there’s a Pecha-Kucha Night near you. You might never look at presentations in the same way again. Where's the Innovation for the Golden Years? I’ve always believed that too many of the products that get touted as being great innovations with well thought out design actually are not necessarily all that great of products with regards to usability by seniors or disabled. One of the main reasons this occurs is that, in general, Western Cultures do not promote interaction with seniors or the disabled. These people get pushed into sub-cultures of sorts and are thus insulated from the society at large. It’s not just current product designs that are senior/disabled non-friendly. Since many social challenges confront people as they age, innovation and improvements to address these challenges are required, but unfortunately are few and far between. What would I suggest to start getting some innovative design work going in these areas? 1. There needs to be greater awareness of the needs of the aging and disabled population. They need to be recognized, not as a subculture that is somehow separate from society, but as an essential part of society in the here and now. 2. Awareness comes from immersion. Unfortunately, immersion can only happen in many cases by visiting places like assisted living centers, and hospitals. In the mean time, we can start by visiting great websites like Serene Ambition – Boomers in Transition. 5. Be sure to visit the Center for Universal Design. Great references there. Finally, younger people need to get out of denial and see the spectrum of life in its entirety. Everyone get’s older. It’s unfortunately common for us to be concerned about what others think about us. After all, sometimes our jobs seemingly depend upon it. Yet there is a paradox at work. The more we’re concerned about what others think about us, the less we’re actually embracing and being ourselves. The less we’re ourselves, the less truly fulfilled we are, the less passion we put into our work and as a result, the less effective we ultimately will be. There’s another aspect at work. When we worry about what others think about us we de facto are giving more credence to other people’s thoughts than to our own. In essence we lose trust in ourselves, and if we don’t trust ourselves we’ll never be bold enough to take our ideas and passions and run with them. Innovation is a wonderful symphony of individuals at the top of their game. That creative insight, that flash of brilliance, the passionate drive to excel – all this comes from individuals bold enough to be themselves. While listening to the song Breathe by Anna Nalick it suddenly struck me that this isn’t the first song called Breathe that I’ve heard recently. So I did a search. 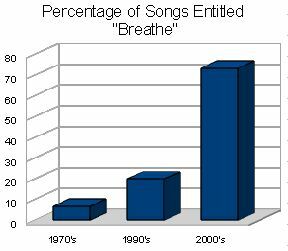 Over 73 percent of all songs entitled Breathe have been released since 2000. Forty percent of all songs have occurred since 2005. I created a mindmap to categorize what the word ‘breathe’ might be connected to. 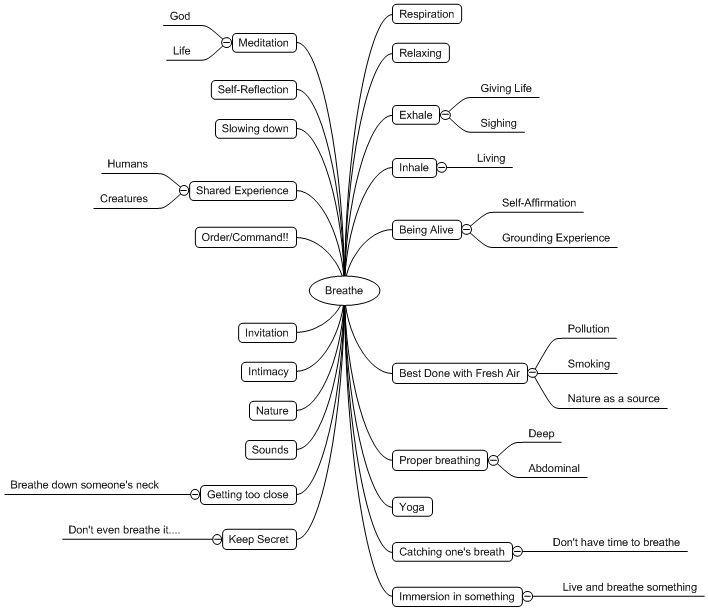 When I got stuck I did a quick search of idiomatic use of Breatheto see if any meanings were missed and there were a couple so I added them to the mindmap. We could learn even more by looking at the lyrics of every song, but I don’t think it’s necessary to dive in that deeply. The word ‘breathe’ is a verb. When it is used on its own in the English language it is used in the imperative form. It’s basically a command. What are the results of following the order? Rest, relaxation, grounding, slowing down, functioning properly, etc. Why do we need to slow down? What do you think of this as a description of the creative process? Some other models are here. – Gave employees equal shares in profits? – Respected everyone as equals in all ways and expected them to live up to their code of honor? – Stayed nimble enough to take advantage of the status quo and was a feared competitor? – Had only three tiers of management, max? – Designed their place of work so that there was no physical, hierarchical office structure and in fact, management ate, drank (and slept!) shoulder to shoulder with the employees? – Designed their place of work to be optimized for their type of business? – Always obtained and used the best technology and tools, often modifying them to optimize their effectiveness? – Valued diverse talents and cultural backgrounds? – Always looked for the best talent but valued passion and commitment perhaps even moreso? – Looked for other resources such as artists and artisans to help build the company but also to provide entertainment? – Gave people the prospect of excitement at work? It sounds like a pretty good place to work, right? In its day, the above business was a welcome change to the stifling, low paying environment of mega-‘corporations’. The only problem was that the above company was illegal to belong to and if you were found to be a member it was a crime punishable by death. The above company is representative of the best of what pirates had to offer. While there wasn’t uniformity among pirate groups, and there were abuses among groups, the survival and prospering of piracy as a way of life is a testimony to what can be done when the person is given rights and a share in their work (and the flip side was there as well-no work, no pay). At a time when people were not seen as individuals with rights and active hands in their lives, the life of a pirate was not just a means of escape, but a way to earn wealth while being part of something bigger – a part of a brotherhood. I bring this up because in some ways today, people feel they are losing individuality, losing a say in where and how they work, feeling they are working too hard for the amount of pay they receive. Companies of all sizes could learn something from pirates in structuring their organizations and cultures, in rewarding their people and providing efficient work environments. What would company floorplans look like with little hierarchy? What would paychecks look like with only three tiers of structure and profits being distributed to everyone in the company? How would people work if they could use the best tools for their jobs and if they knew they were valued? When pirates boarded a ship they would ask the crew for their opinion of their Captain. If they thought he was good and fair Captain, he was rewarded with cash and given a boat. If he was not liked he was beaten up. How would CEO’s manage their companies if they knew this rule would be applied to them if their companies were ever acquired? To learn more about pirate life and if you’re in the Chicago area check out the pirate exhibition at the Field Museum of Natural History. It’s well worth the trip to see what pirates lives were like and what their world looked like. Different tools are required for different tasks. When it comes to mindmapping and information management there are tons of possibilities. I came across this software called VUE. 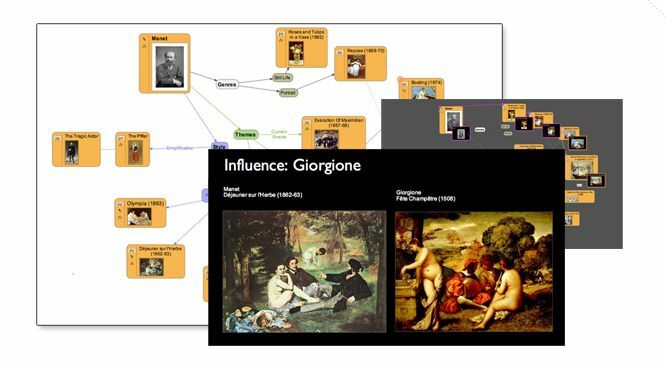 It’s less of a mindmapping tool and more of an information visualization tool. Its strength lies in the multiple ways information can be arranged, sorted and manipulated. I can see this working great for process analysis and research purposes. Check out this video that also utilizes some pretty slick interaction tools. The best thing about it? So download it and play with it. I’m sure you’ll come to like it and see multiple uses for it!